The word 'Roulette' comes from the French language and means 'little wheel'. Invented by French scientist and mathematician Blaise Pascal, the game of Roulette is proudly a French original. 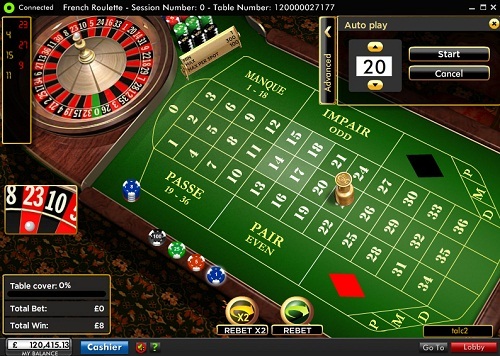 Similar to the European variation of Roulette, in the game of French Roulette players wager on either a single number or a range of numbers, the colours red or black, or whether the number is odd or even. To determine the winning number and colour, a croupier spins the Roulette wheel in one direction and a ball in the opposite direction around the numbered track of the Roulette wheel. The ball eventually falls into one of 37 numbered and coloured pockets on the wheel (0 to 36). 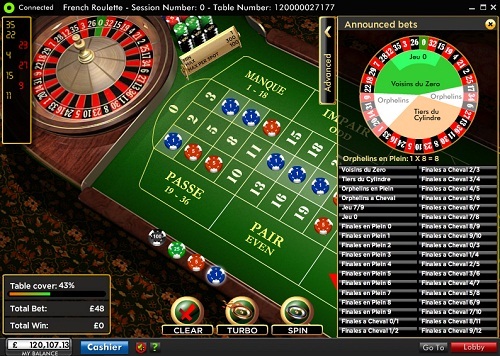 The same Inside and Outside Bets found in European Roulette are also available at French Roulette tables, only their names appear in French (see below for a full list). Inside Bets are bets on numbers straight up or on a line between numbers that select a combination of numbers. Outside Bets are any of the bets in the boxes surrounding the numbers on the table. 2. 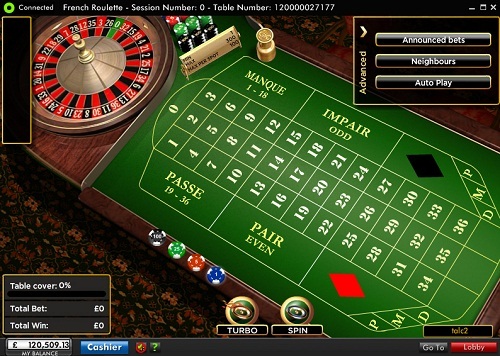 Click on the bet you wish to place on the French Roulette table. 3. Click on Spin or Turbo Spin. If the ball lands on 0 (zero) in French Roulette, players only lose half their original even bets. This rule applies to all even Rouge/Noir, Pair/Impair and Manque/Passe bets. 1. Click on Announced Bets in the Advanced Panel. A bets table will appear. 2. Scroll over the table to view the number of chips that are needed for each bet. 3. Click on an Announced Bet or a segment on the Roulette wheel image to place a bet. Chips are placed on all relevant numbers. 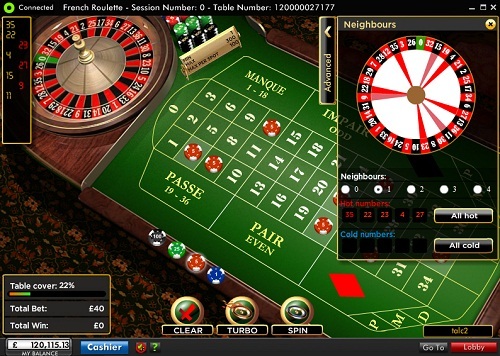 Neighbour Bets allow players to wager on numbers that appear next to a certain number on the Roulette wheel. For example, a 1-number Neighbour Bet on 12 would include 12 as well as 28, the neighbouring number on the left, and 35, the neighbouring number on the right. Players can place up to 4-number Neighbour Bets (four numbers that appear adjacent to a number on the left and on the right sides). 1. Click on Neighbour Bets in the Advanced Panel. 2. Click on the number of Neighbour Bets you wish to wager on (1 – 4). The Neighbour Bets window will always showcase the five numbers that have won the greatest number of rounds (Hot) and the five numbers that have won the least number of rounds (Cold). Players can quickly and easily bet on one or all five Hot or Cold Numbers from the panel. Every number on the Roulette wheel is categorized by a level of 'hotness' or 'coldness'. This is illustrated on the Advanced Panel by designated colours that fill the pie-shaped space below each number on the Roulette wheel. If two numbers were called the same amount of times, the number that was called last is hotter. Plein (Straight Up): Place a bet directly on any single number. Cheval (Split Bet): Place a bet on the line between any two numbers. Trio Bet: Place a bet on the intersecting point between 0, 1 and 2, or 0, 2 and 3. Transversale Pleine (Street Bet): Place a bet at the end of any row of numbers, covering three numbers. Carré (Corner Bet): Place a bet on the corner where four numbers meet. Transversale Simple (Line Bet): Place a bet at the end of two streets on the line between them. A line bet covers all the numbers in either street, for a total of six. Douzaine (Dozen Bet): Place a bet in one of the boxes marked "1st12", "2nd12", or "3rd12", each covering twelve numbers. Colonne (Column Bet): On the short side of the Roulette table are three boxes marked "2 to 1". By placing a chip in one of these boxes, players mark all twelve numbers above it (excluding 0). Manque (1-18) / Passe (19-36) (Low/High Bet): Place a bet in one of the boxes marked "1 to 18" or "19 to 36", each covering 18 numbers. Rouge/Noir (Red/Black) or Pair/Impair (Even/Odd): A bet placed in one of the four boxes, on the sides of the board, covers half of the numbers on the board, as described in that box. The zero in not covered by any of these boxes. Each box covers eighteen numbers. Transversale de Quatre (Four Number Bet): A bet placed at the corner of the intersection of 0 and 3, covering the numbers 0, 1, 2, and 3.